Daddy is your child’s hero! 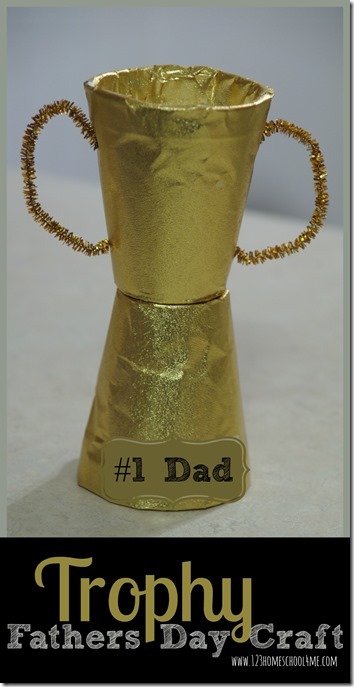 Here is a fun, easy-to-make Trophy Fathers Day Craft for kids to make that will show Dad just how important he is. I love helping my kids come up with cute Fathers Day crafts that they can make themselves. They are such sweet ways for kids to show Daddy how much they care and make such treasure keepsakes too. 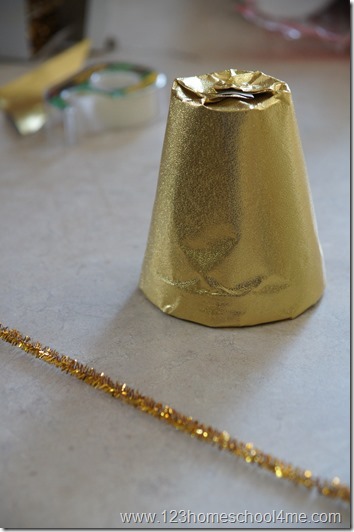 Here is a fun, unique craft you could use for Fathers Day, new years eve, end of the school year, and many other uses. There are two ways to make your trophy craft. The “neater” looking one is to wrap two cups separately then attack. The easier way for kids is to attach the cups and then wrap them together. 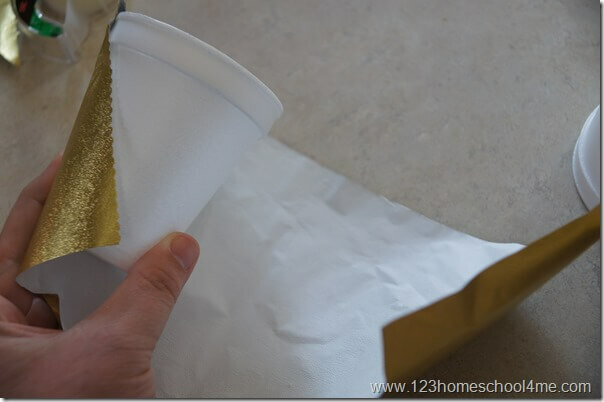 Wrap at an angle so that you will be able to tuck the edges in the cup and fold them down on the other side like a present. This way you won’t need tape which will take away from the look of your trophy. Place the first cup wide end down (as pictured). Now put 1-2 pieces of rolled tape on the top narrow part. Place another wrapped cup narrow end down on top. The tape will hold them together to make the trophy shape. Cut a gold pipe cleaner in half and insert one section in the top cup on the right side making a hole for each end to make a handle. Repeat with the other pipe cleaner section on the left side. 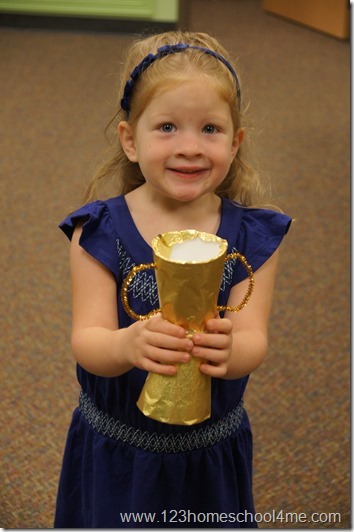 Kids will be so proud of the trophy they made and super excited to give Daddy a Trophy they made themselves. Hint: Use a sharpie to write “#1 Daddy” on the bottom if you like.